Tag line: "They burned the father, killed the mother, and raped the sister!" 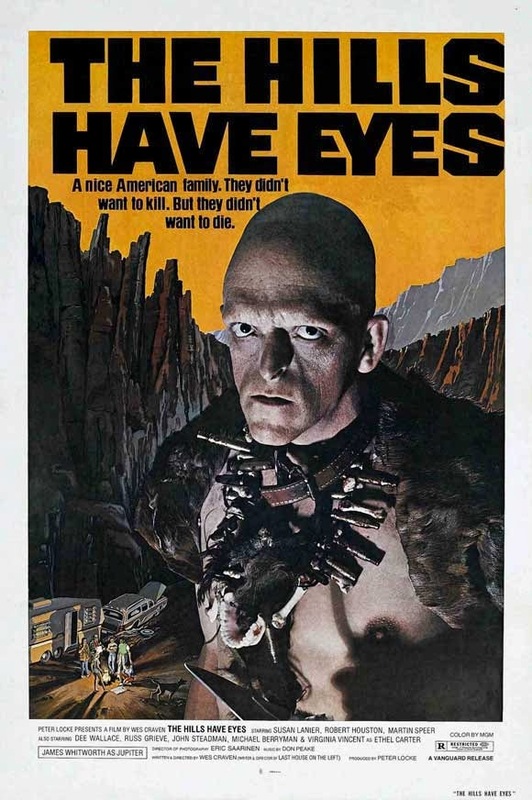 Five years after he made his directorial debut with the savage The Last House on the Left, director Wes Craven delivered yet another brutal classic, The Hills Have Eyes, in which a typical American family is terrorized by a pack of ruthless, inbred monsters. While on their way to Los Angeles, the Carter family of Cleveland, Ohio, which includes patriarch Bob (Russ Grieve); Ethel (Virginia Vincent), his wife of 25 years; and their kids: teenagers Bobby (Robert Houston) and Brenda (Susan Lanier) and eldest daughter Lynne (Dee Wallace), whose married to Doug (Martin Speer) and has a baby of her own, stops to refuel at a rundown gas station in the middle of the California desert. The proprietor, a haggard old man (John Steadman), advises Bob to turn around, warning there are dangers on the road ahead. Ignoring his pleas, Bob presses on, only to crash his car in the middle of nowhere. Leaving young Bobby behind to look after the women, Bob and Doug head in opposite directions, hoping to find someone who might be able to help. Unbeknownst to them, a family of vicious cannibals, headed by Jupiter (James Whitworth), has been watching, and is about to turn their cross-country trip into a living nightmare. Part of what makes The Hills Have Eyes such a hard-hitting motion picture is the family at the center of it all. The Carters are a close-knit group, protected by Bob, a retired policeman, and held together by his deeply religious wife, Ethel. Craven allows us to spend some time with the Carters prior to the chaos, and as a result we grow to like them. Soon after the accident, Craven reveals just how much danger the Carters are in by way of a few POV shots, where we’re looking in on them through the cannibal’s eyes, watching from a distance as Ethel leads the family in prayer and listening as Jupiter’s son, Mars (Lance Gordon) radios in to his brothers Pluto (Michael Berryman) and Mercury (Arthur King), telling them “They’re easy pickins now” once Bob and Doug leave the others behind. I found these scenes particularly disturbing, yet they pale in comparison to what happens when the sun goes down, at which point Jupiter and his clan descends upon the unsuspecting family, a sequence that feels like a punch to the gut mostly because Craven forces us to watch every single moment of the carnage. Playing on our basic fear of isolation and featuring moments of brutality sure to turn your stomach, The Hills Have Eyes is every bit as essential to the genre as Craven’s mainstream masterworks, A Nightmare on Elm Street and Scream, and is a film that all horror fans should experience at least once.